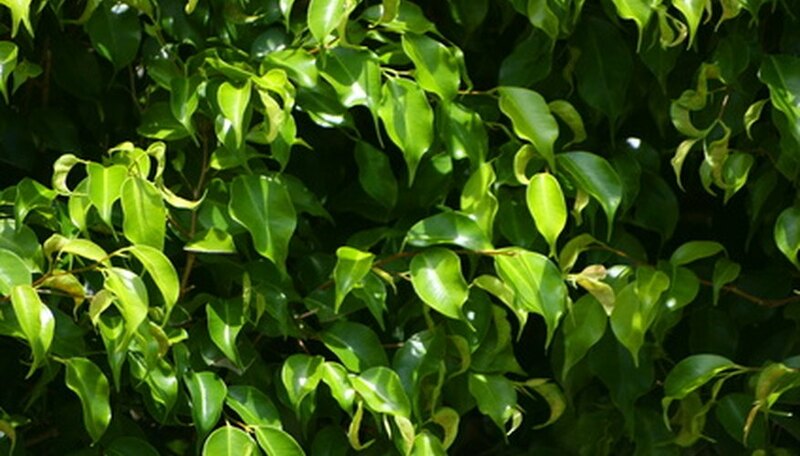 The ficus “Monique” is a variety of Ficus benjamina or more commonly known as a weeping fig. This cultivar is small with dark, narrow-green leaves, rippled along the sides. The ficus is a graceful small tree with thin gray, weeping branches. Used mostly as a houseplant or office plant, the ficus is known for dropping its leaves during any kind of stress. Monique has a superior resistance to leaf drop, making it a more popular variety of the tree and the best variety for indoor gardening beginners. Keep the tree in bright filtered sunlight in the spring, summer and fall. It needs direct sunlight in winter. Maintain room temperature at 75 to 85 degrees F during the day and 65 to 70 degrees F at night. Place pebbles in the drain tray under the container. Water the tree until the water comes through the drain holes and into the tray of pebbles. Leave the water in the tray to provide humidity for the ficus, but don’t allow the container to sit directly in the water. Water when the soil starts to dry out during the growing season. Allow it to remain dry for a two to three days during the winter before watering again. Apply a liquid houseplant fertilizer once a month in the spring through mid-fall. Do not use fertilizer when the tree is not growing or it can cause damage to the root system. Follow manufacturer’s directions for amount to apply. Wash the leaves once a month with warm water to clean off the dust. Add 1 tsp. of gentle dishwashing liquid to 1 gallon of water, and wipe the leaves with the soapy water if a white sticky substance on the bottom of the leaves or spider mites appear. Prune the plants any time to shape them or keep them small. Ficus “Monique” will tolerate pruning well. Reduce watering when you prune severely.